England is facing its gravest threat yet. The Spanish have declared war, and Elizabeth finds herself attacked by sea - and by Catholic conspiracy from within her own court. Master Goodluck goes undercover, tasked with discovering the identity of this secret assassin, leaving his ward Lucy not knowing if the spy is alive or dead. Meanwhile Queen Elizabeth is growing old in a court of troublesome young noblemen, while Lucy is struggling to love a man whose duties lie elsewhere. Her Last Assassin is the third book in the Lucy Morgan series by Victoria Lamb. Having not read the previous two books in the series I was nonetheless excited to plunge into the Tudor world I so love and can't get enough of. The author does a good job bringing new readers up to speed on the backstories of her characters so that they don't feel too lost by not reading the first two books. However, I do think reading the previous books would have been beneficial as it might have made it easier to fully understand and appreciate the various passionate relationships and vicious rivalries going on. And there are quite a few! There are four main characters that are all very well developed and intriguing in their own way. Queen Elizabeth is older in this story and is having difficulty balancing the many problems around her - the ongoing Spanish war, the seemingly constant threat of assassins, the pressure on her to name an heir, the stress and jealousy of getting older while the courtiers and ladies around her are young and virile - while still appearing strong and completely in control. She's selfish, vain, hypocritical yet also caring and giving when she wants to be. I loved this aging, unpredictable Elizabeth! Master Goodluck, one of the queen's spies, is constantly searching for would-be assassins and dissenters and trying to balance his duty to the queen and to England with his concern and growing affection for his ward, Lucy Morgan. Lucy is a lady-in-waiting to Queen Elizabeth, known for her beautiful voice and dark skin. She spends the novel trying to follow the established rules of conduct for ladies-in-waiting while also trying to hide her passionate love affair with the married playwright William Shakespeare and, towards the end, another man. Shakespeare was my least favorite main character, completely abandoning his family in the country while gallivanting around London doing whatever he pleased. He seems to truly love only himself as his affections seem easily changeable and he is about as disloyal as they come. He does show glimmers of guilt for his actions from time to time but even those end with him placing blame on someone else for what he does. The relationships between the various characters kept changing, rather abruptly at times, so that I couldn't help but doubt the true intensity of their feelings for each other. So, while they are all interesting characters on their own I didn't really feel invested in their relationships together. There are two rather odd shifts in relationships that I didn't see coming and, to be honest, didn't really see as beneficial for the story as a whole. Maybe reading the previous two novels would help alleviate some of that confusion, but as it is I wasn't that interested in these shifts of passion. What really drove the story and kept me turning the pages was the author's wonderful descriptions of the Tudor court and all the glitter and danger that comes with it. I loved the immersion in the intrigue and struggles facing England during this time and seeing how its court and the Queen's council kept transforming and shifting even as Elizabeth tried to keep it as she wanted it. I only hope that there is another book in the series as it leaves off without much resolution for its characters. I would love to see how Ms. Lamb could round out the storylines. 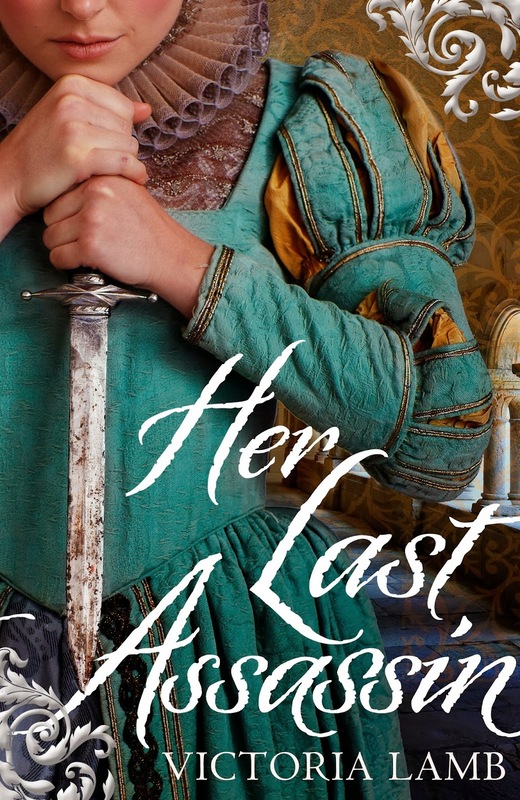 Her Last Assassin is enjoyable historical fiction set during a turbulent time in English history. There was more romance than I typically enjoy but I would definitely be interested in reading any follow up that might give some settlement to the loose ends in the characters lives. Each character's individual plotlines were enjoyable and I would love to see how the author could wrapped them up. I think it's beautiful although I don't think it has much to do with the story. The woman on the front is clearly not Lucy and can't be Elizabeth as she is much older in the book. The only potential assassins mentioned in the story are men so that wouldn't fit either. It's still very eye catching and would be the sort of cover to draw my attention every time. I am so happy to be able to offer up one copy of Her Last Assassin for giveaway! It is open worldwide and will run through Sunday, March 9th. To enter, just leave a comment below and I will pick a winner at random on Monday, March 10th. Be sure to leave your email address in the comment so I can notify you if you are the winner (no email address, no entry). For extra entries just share online and leave a separate comment with where you shared and leave a link. Good luck!!!! This book looks like a great read! Definitely adding it to my TBR list! It is a lovely cover - if a bit threatening with that big knife! Sounds good. Please count me in and hoping its open to all! Hi Mystica! Yes, the giveaway is open worldwide! I've not read a Tudor novel in ages--this sounds good--especially the descriptions--can you add my name to the hat? Thanks! This sounds great! I would love to win a copy. Sounds like a book I want to add to my TBR pile. This sounds like an awesome book! Thanks for the giveaway! Hello everyone! Using a True Random Number Generator the winner is (drumroll please).....Denise! Congratulations Denise and I will be sending you an email to get your mailing address. Please respond to my email within 2 days, otherwise a new winner will be picked. Thank you to everyone who entered and please keep an eye out for more giveaways in the near future!